I recently updated Eclipse via its automatic updates to the most current version. I also downloaded the brand new Ice Cream Sandwich SDK. Somewhere along the way, some Eclipse packages became out of date or misaligned. After performing several project clean/build and Eclipse restart cycles, I finally found the right google search term to lead me to this post. Here is the correct answer in a bit more visual presentation. 1. Open SDK Manager. In Eclipse goto Window -> Android SDK Manager. There’s also a handy button for it in the Eclipse toolbar. 4. 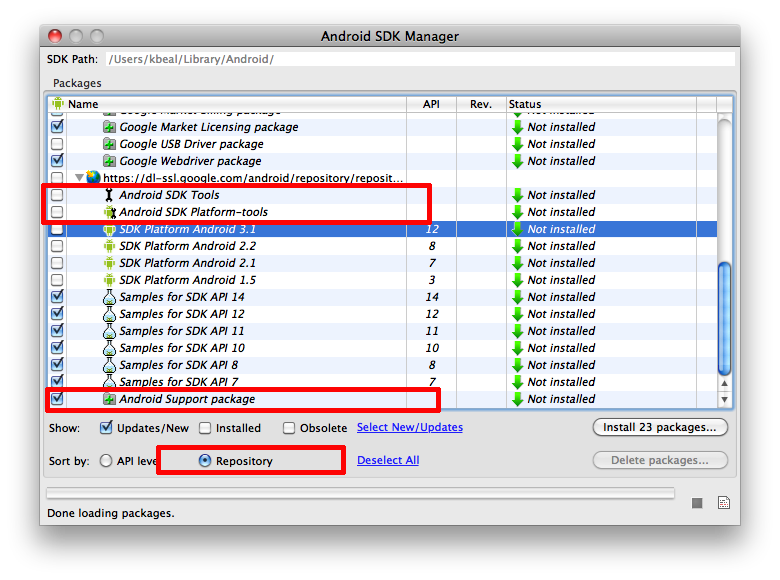 Install the latest versions of ‘Android SDK Tools’, ‘Android SDK platform-tools’, and ‘Android Support Package’. 5. Once they’re finished installing, restart Eclipse for good measure. That should take care of the strange build error and send you on to finding actual bugs. If the anti-virus is truly off, I’d trouble shoot permissions issues next. If this is a Windows machine I suggest running Eclipse as administrator during the update.